We sat down with our Head of Education, Claire Boyer, and talked about her Smith journey from the very beginning all the way to today. You’ll walk away with a new appreciation for tea as well as a few tips and tricks to apply next time you brew up a cuppa. How did you get started at Smith Tea? I started out working in our Tasting Room, three days a week at our original Thurman location. That was eight years ago. At that time, with only about 8 people working at Smith, customers would walk in and ring a remote doorbell, which would signal to someone up in the office. That person would then run down, say hello, make the customer a pot of tea and then go back to their desk. It soon started getting busy enough where we needed to have a dedicated tea tender behind the counter to manage the influx of customers. And that was me. Have you always had a love of tea? Yes. 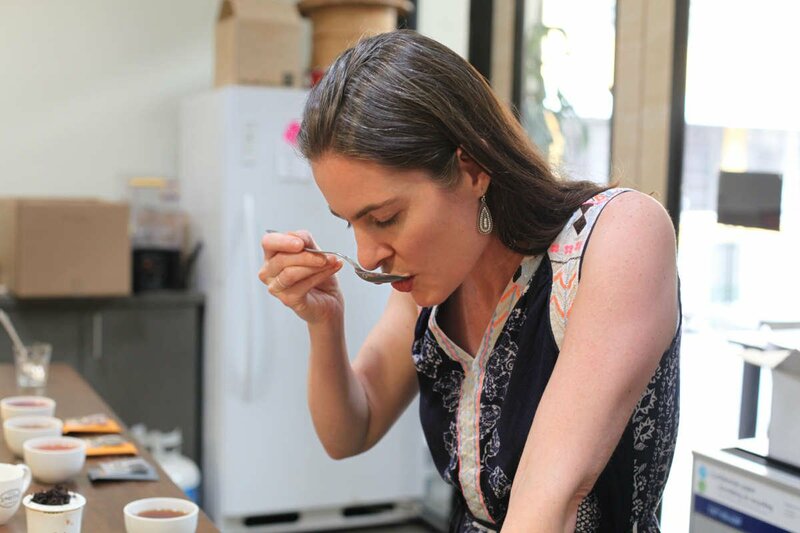 I was already exploring tea and buying from various online companies, but honestly, my curiosity and passion for tea started to grow once I got deeper into making it, serving it and talking about it in the tasting room. Steve was definitely instrumental in my quest for knowledge and helped my passion grow into a career. Can you explain to us what you do and what your day-to-day looks like? As a member of our Tea Department and the Head of Education, I have my hand in a lot of different pots. I’m involved with activities in the Tea Lab like tea evaluation and formulation. I also lead trainings for staff and visitors, and create educational resources. Working for a small but mighty company like Smith means there is never a typical day. I’m usually running around talking to the various departments that work closely with the Tea Department, like Production, for example. I also host a tea blending workshop for the public on Saturdays in the Tea Lab, which can be booked via Airbnb. Early April is one of my favorite times of year because Darjeeling 1st Flush season has officially begun. Much of today was spent in the tea lab, tasting our way through the offerings from our growers and evaluating teas for purchase. If I had to choose, I would say educating folks who are new to tea and watching their excitement unfold. How do you feel tea has influenced your life? It’s brought adventure, self-reflection, and connection. I’ve made incredibly wonderful connections with people over a shared pot of tea. Many of my closest friends are the lovely people I’ve met while working in the tea industry, or right here at Smith. There is something rather special and charming that happens when you all drink from the same teapot, which sounds cliche. But I notice it every time. As a Department, we intentionally sit and share a pot of tea twice a week. What is your favorite blend you have collaborated on? Portland Breakfast. It came together effortlessly (which was an unexpected surprise) and was an instant winner. What do you find fascinating about tea? To me, the energetics of tea is one of the most intriguing aspects. How when you take this beverage in, your own chemistry and energetic input are affected. And there are subtle healing properties that surround it. Drinking tea in nature only augments this awareness. I love bringing a small tea set on a hike or to the river for this reason. What's your top Smith moment? I’ve had several, but one that stands out was when the Wall Street Journal came to our NW Thurman location to do a story on Steve and all his years in the industry. They designed a shot with Steve holding a tea cup and an RTD (Ready to Drink) bottle, and they wanted two more Shiva-like arms coming out from each side. They were thinking Kim, Steve’s wife, could provide the extra arms, but she wasn’t there, so I stepped in as an arm model. I was crouched low trying to conceal myself behind Steve in this awkward position holding a tea pot and another tea cup with dry ice, sweating under the lights, but really enjoying being there in that moment. Last year, I visited Grasse, France and took a perfume making workshop. The French way of making perfume is similar in some ways to tea blending. There is the base note, the heart, and the peak or top notes, and I sometimes think of tea in the same way. 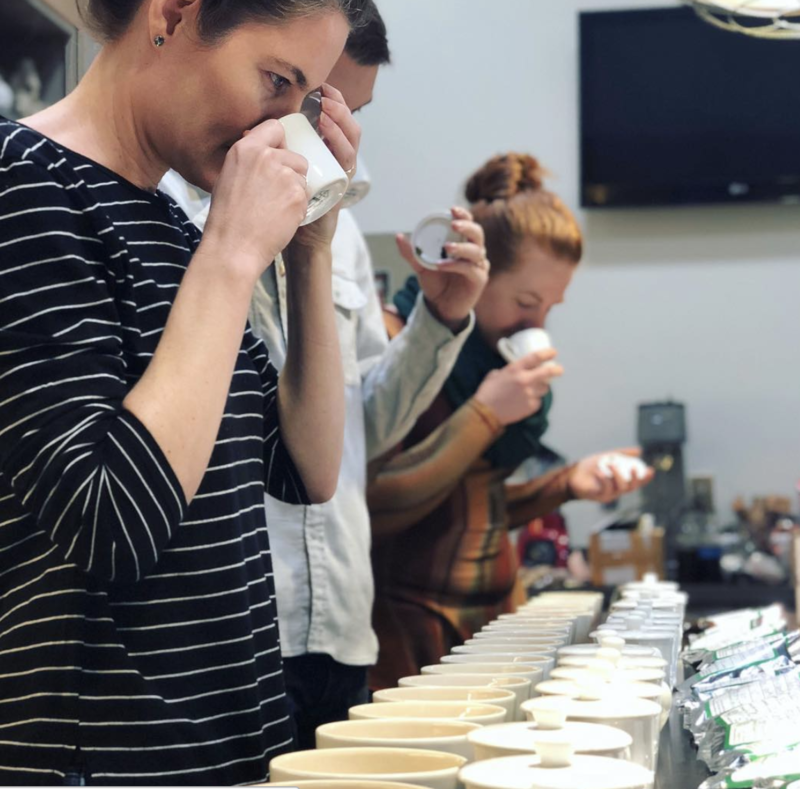 When constructing a blend, you can have a base to ground the blend, your mid-range notes to fill it out, and then top, bright notes to finish it off. It’s trips like this one that make me excited to come home and create a blend that not only would I love to drink, but also share with our customers. What gets me out of bed in the morning is thinking about what tea I’m going to pair with what breakfast ideas I have. Like an egg and cheddar sandwich on whole wheat stuffed with spinach. British Brunch would be a top contender. For some people who are just getting into tea, what are some tips you can give them. you’ll be surprised to find sweetness and the complexities of flavors that can come out. It’s a game changer. Also, don’t be shy to visit your local tea shop and ask the person behind the counter for their suggestions. Try as many different varieties of tea as you can. Are there tools that first time users should have? When I was starting out, it was a small, one-person glass teapot with a brew basket that became my go-to. You can brew any loose leaf tea this way, and watch as the color changes. That, and having a cup you adore drinking from can turn your tea time into a treasured ritual.